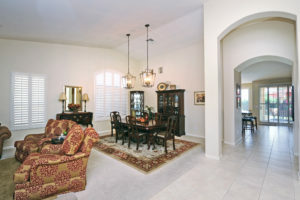 Oakwood Country Club Home Available - 24207 S. Lakestar Dr.
You are here: Home / Chandler AZ Real Estate / Oakwood Country Club Home Available – 24207 S. Lakestar Dr.
Oakwood Country Club Home Available – 24207 S. Lakestar Dr. 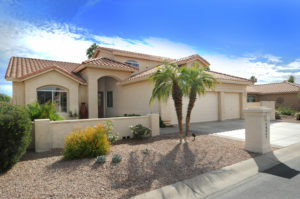 This Sun Lakes, Oakwood Country Club Home won’t be available long! Check out this just-listed home with an updated, Marbella floor plan. The master suite and all living is on the main floor. And there are two guest bedrooms and bath on the upper level. A beautiful courtyard with pavers usher you into this lovely home with new doors, formal living and dining room and a separate office. Here, you’ll find neutral carpet and tiled floors to accommodate any decor. And you’ll love entertaining in this gourmet kitchen with a black granite back splash, granite tiled counters and refinished cabinets. Enjoy the views of the lush landscaping and putting green in the backyard through your large, picture windows in the kitchen, dining and family room. Organize all of your clothes and shoes in the two, walk-in closets in the master. You’ll also find raised height counters, a separate shower and tub and access to the patio from the master suite. Plus, there is a new, downstairs AC, shutters throughout, a half-bath update, and a 3 car garage! This Oawood Country Club home is move-in ready with many extras. There is a new water softener and RO in 2015, rain gutters added, a new garage door opener and springs, added recessed lighting in the hallway, and a new gas cook top. 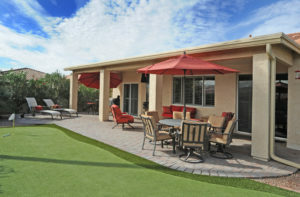 All of this in a gated 55+ community with resort amenities including: Golf, Tennis, Pickle Ball, Heated Pool & Spa, Workout Facility, Clubhouse/Rec Room, Biking/Walking Paths, an On-site guard and Concierge, and more! 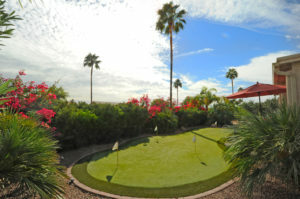 Plus, you are within a half-hour drive to Sky Harbor International and Mesa Gateway Airports! Call us now before the competition snatches this up at (480) 440-0849!